We love maps here at gHacks, especially ones that show technology trends around the world. The latest is asocial networking trends map from Vincenzo Consenza who has partitioned the planet up to show what social networks are predominantly used in which countries. It shows clearly the lack of Facebook access in China and, frankly how many other countries around the world use the world's largest social networking site. He also has a series of other maps showing social networking across the globe dating back to last year. You can view the maps at his website. 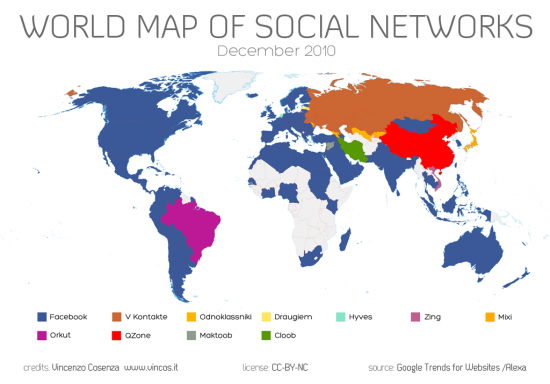 The social map shows the dominant social networking site in every country and on every continent on earth. The map, which is based on December 2010 data. Facebook is dominating North America, Europe, Africa, Australia and most of South America. Other social networking site that dominate at least one country are Orkut in Brazil, QZone in China, V Kontakte in Russia and Mixi in Japan.